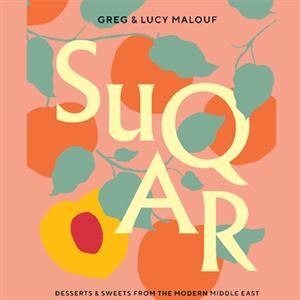 In recent years, Persian love cakes have had a big moment in the sun and Greg was amused by the idea of creating his very own Lebanese love cake. 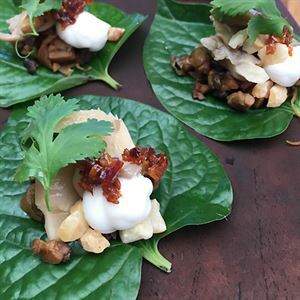 He wanted it to showcase some of the defining flavours of his childhood – cardamom, rose and, naturally, his favourite, lemon – and he wanted to pull out all the stops on the glamour front. The cake itself is a moist lemon-scented white chocolate sponge and was inspired by a recipe from American baker Rose Levy Beranbaum. It's pretty straightforward to make, which is pleasing, given there are several other component parts to achieve as well. 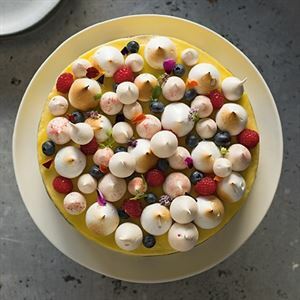 There's a lemon mousseline icing and Italian meringue for decorating. We add Mini meringue kisses as an additional decoration, but you could buy or omit these if it's a step too far. We're not going to pretend this cake isn't a bit of a labour of love, as well as a love song to Lebanon, but we think the results speak for themselves. It's visually stunning and, crucially, tastes divine. Lucy's husband, George, rates it as a ‘more-than-two-slicer', which is praise indeed. Preheat the oven to 150ºC fan-forced/170ºC. Grease and line the loose-based or springform cake tins, then grease the paper too. Put the chocolate in a heatproof bowl and place over a saucepan of barely simmering water, making sure the water doesn’t touch the base of the bowl. Stir occasionally until the chocolate has melted. (Alternatively, put it in a microwaveable container and cook on full power in 20 second bursts until the chocolate has all but melted.) Stir to combine evenly, then leave to cool to room temperature. Use a fork or balloon whisk to mix the egg yolks with a third of the milk. Rub the lemon zest into the sugar, to release the citrus oils and to stop the zest clumping. Put into the bowl of an electric mixer along with the flour, baking powder, salt and ground cardamom. Beat on low speed with the paddle attachment for 20 seconds. Add the butter and beat for another 20 seconds, then add the remaining milk and beat until it has been mostly absorbed by the dry ingredients. Increase the speed to medium and beat for a good minute. Scrape down the sides of the bowl. Add the egg mixture in three batches, beating in well after each addition. Scrape down the sides of the bowl and add the melted white chocolate. Beat in evenly. Divide the cake batter between the prepared cake tins. Use scales if you are pedantic, around 550 g (1 lb 3 oz) per tin. Bake in the lower third of the oven for 20–25 minutes. Once a skewer comes out clean and the cake springs back to the touch, remove from the oven and rest in the tins on a wire rack for 10 minutes. Run a spatula around the edge of the pans to loosen the cakes, then unmould them onto the wire rack, top-sides up, and leave to cool completely. Peel away the baking paper very carefully. For the lemon mousseline, first combine the sugar and lemon zest in a small heatproof bowl and rub them together. Whisk in the eggs, then the lemon juice. Set the bowl over a saucepan of barely simmering water, making sure the water doesn’t touch the base of the bowl, and whisk until it reaches 83ºC on a sugar thermometer. Push through a fine-mesh sieve and cool to 60ºC. Measure 100 g of the butter and drop it into the lemon emulsion in small pieces, mixing with a hand-held blender. Continue blending for 10 minutes to form a very smooth, pale lemon curd. Set aside at room temperature. Put the remaining 120 g butter in the bowl of an electric mixer.\ Whisk for 8 minutes, until very thick, pale and fluffy. Add a quarter of the lemon curd to the butter. Whisk in slowly, but thoroughly. Repeat in three more batches until all the curd is incorporated into the butter. Set aside. It’s easiest to ice and decorate this cake on a stand. First, warm the jam briefly to make it workable, then mix in the rosewater. If it is very stiff, you might need to add a squeeze of lime juice (or a splash of warm water) too. With a long serrated knife, carefully slice away the tops of each cake to even them, if need be, then slice each cake in half, crossways. Spread a generous layer of the jam onto the two bottom cake layers, then sandwich each with its top. Carefully lift one cake onto the cake stand. (A large dinner plate or clean board can help with this.) Spread the surface with a thick layer of lemon mousseline, almost to the edges, then carefully lift the second cake on top and squeeze gently. Use a small spatula to ice the surface and sides of the cake thickly and evenly with the remaining mousseline. Refrigerate for 45 minutes for the mousseline to firm up. Meanwhile, make the Italian meringue. Combine the sugar and water in a small saucepan. Heat gently to dissolve the sugar. Put the egg whites in the bowl of an electric mixer and whisk to stiff peaks. Use a sugar thermometer to measure the temperature of the syrup. When it reaches thread stage, at 120ºC, pour it onto the egg whites in a slow, steady stream, whisking slowly all the time. Once incorporated, increase the motor speed to high. Whisk for around 8 minutes, or until the mixture cools completely. You will see it dramatically bulk up into a soft, fluffy mass. Spoon into the piping bag. Set aside. 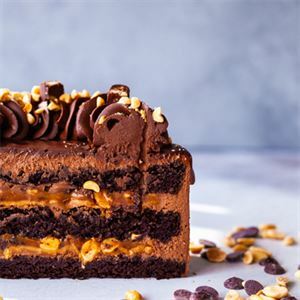 Now comes the time to unleash your inner artist: you can exercise restraint, and limit your decoration to the top of the cake, or go wild and cover the sides, too. Pipe on little drops of meringue, holding the piping bag vertically above the baking tray. As you pipe, lift the nozzle straight up to form tiny peaks. Aim to pipe a range of sizes, ranging from 2–3.5 cm in diameter. Use a kitchen blowtorch to lightly brown the tops of the meringues, working quickly so you don’t melt the mousseline icing. 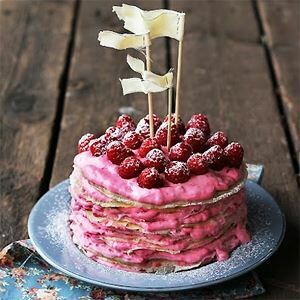 Complete the decoration by adding meringue kisses, fresh flowers, raspberry powder, thyme and some artfully arranged berries. Be sure to serve at room temperature so the sponge cake softens to optimum moist tenderness. Indulgence on top of indulgence - a perfect cake for all ages to enjoy.